HGTV series spotlights Maine cabin renovators. Chase Morrill does not like to waste anything, not one little thing. The Augusta native has been salvaging old bed frames, vacuums, canoes and just about anything else he removes during reconstruction of the numerous Maine cabins he, his family and his construction crew are frequently asked to renovate throughout the year. Morrill has been in the construction field for more than 15 years. His ability to update and modernize any cabin no matter how dilapidated it is, while still maintaining its rustic Maine charm, caught the eye of the DIY network last year. 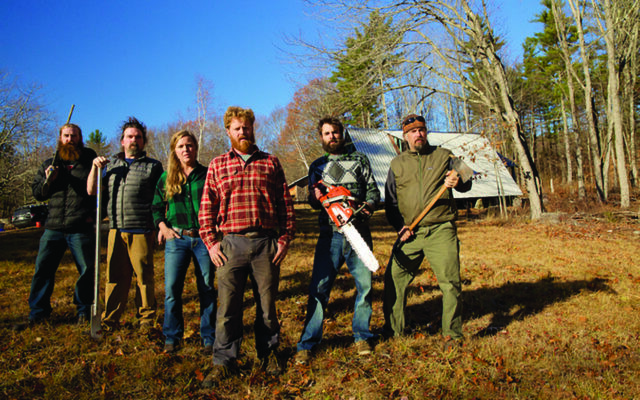 It wasn’t long before Dorsey Productions was following Morrill, his sister Ashley, his brother-in-law Ryan, and their friends Lance, Dixie, and Jetti, deep into the Maine woods to film the reality show, “Maine Cabin Masters.” The show is currently in its second season of production. Morrill and his team have renovated camps in Belgrade, Wayne, Bar Harbor, Dedham and all over the state. No two camps are alike, and neither are the renovations or the budgets. However one thing that always remains the same is that Morrill is adamant his crew recycles as much as they can. Working with family can be a both a blessing and a curse. “Chase and I fight sometimes, a lot of times. But we always end up forgetting about it an hour or two later,” Ashley Morrill-Eldridge said during the taping of the show. During season one of “Maine Cabin Masters,” the crew just happened to have a connection, in one way or another, with every camp owner they worked with. They were either friends, friends of friends, or a relative. But Morrill admits the cabin his crew fixed up for former state legislator Rob Eaton in Hancock County was their most memorable work to date. This season Morrill and his team will tackle 13 cabins in the Damariscotta, Wiscasset, and Farmington areas. They’ve also received numerous requests to lend their talents and skills to neglected camps outside of Maine. “People have old family camps that just always, always need work. We got over 100 submissions this year from people from California, Michigan, and Colorado that say, ‘We’ve got a camp out here we’d love for you to fix up,’” explained Morrill. However, staying close to home, true to their roots and their rustic ways has kept Morrill and his crew well grounded and gainfully employed as their popularity has soared throughout the show. Maine Cabin Masters can be seen on the DIY channel. For showtimes and listings, log onto www.diynetwork.com.